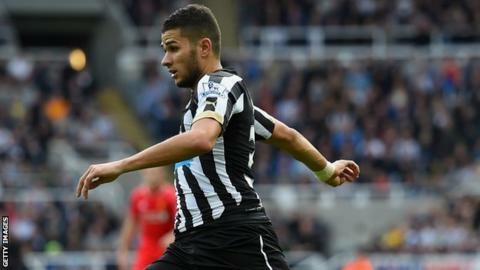 Algeria have confirmed that their Newcastle midfielder Mehdi Abeid (pictured) and Trabzonspor defender Essaid Belkalem have been ruled out of the 2015 Africa Cup of Nations because of injury. Abeid, 22, has a toe injury and Trabzonspor defender Essaïd Belkalem is out with a hamstring problem. Both players were called up by Algeria coach Christian Gourcuff in his final squad for the Nations Cup, which kicks off on 17 January in Equatorial Guinea. Abeid, who featured for Algeria in Olympic qualifying in 2011, was one of five changes to Algeria's 23-man World Cup party. Ishak Belfodil, Foued Kadir, goalkeeper Doukha Izzeddine and Mehdi Zeffane were also brought in. Uncapped Metz midfielder Ahmed Kashi has been brought in to replace Abeid, with Osasuna's Liassine Cadamuro coming in for Belkalem. BBC African Footballer of the Year Yacine Brahimi has also been included, as well as veteran defender Madjid Bougherra. But goalkeeper Cedric Si Mohamed, Hassan Yebda and Nabil Ghilas were left out by Gourcuff, despite having been part of the World Cup squad that reached the last 16 for the first time in Brazil last summer. The Algerians are in Group C at the 2015 Nations Cup in Equatorial Guinea with Ghana, Senegal and South Africa for the 17 January to 8 February finals. Goalkeepers: Rais Mbolhi (Philadelphia Union, USA)), Doukha Izzeddine (JS Kabylie) Mohamed Lamine Zemmamouche (USM Alger).